On May 3rd and 4th the 90th annual FFA State Convention was held at the Ohio State Expo Center. To start off the trip, the group of 15 members took a tour at Franklin Park Conservatory. The tour included seeing a butterfly garden, botanical gardens, variety of biomes and much more. After the tour the group arrived at the Expo Center to attend the first general session. In the first general session, the chapter received FFA charitable giving recognition, the chapter donated proceeds from the 3 on 3 Basketball Tourney to Nationwide Children’s Hospital. The members got to hear a keynote speech from Gian Paul Gonzalez, he talked about going all in and trying your best at everything. The chapter also attended the second session later that night. A small group of members returned Friday to continue with the convention experience. The members attended a workshop, and the fourth and fifth general sessions. At the fourth session Ginnie Mills accepted the Gold Rating for the chapters treasurer’s book on Shelby Alloway’s behalf. 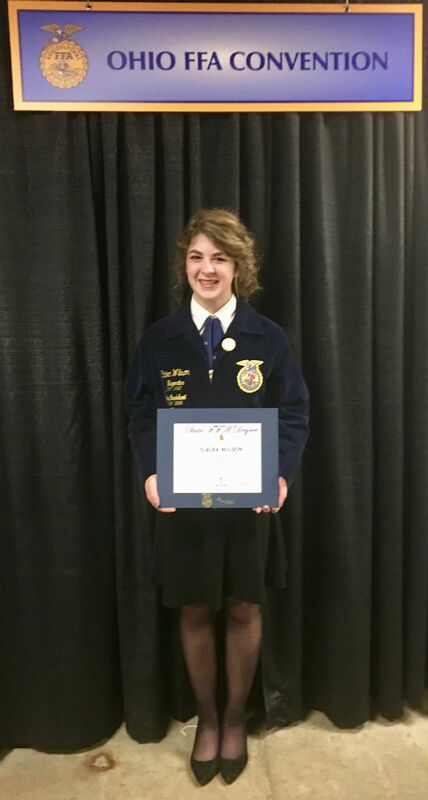 Later in the evening at the fifth and final session, senior member, Clair Wilson received her State FFA degree! Overall, the chapter had a great time with their convention experience and were excited to be recognized on stage.